Police departments across the nation are implementing body-worn camera programs in an effort to create a more objective record of officers’ activities. As recent news events have proved, these videos can provide crucial information about what transpired in a situation. Gaining access to bodycam videos, however, is proving to be an uncertain and challenging endeavor for journalists. 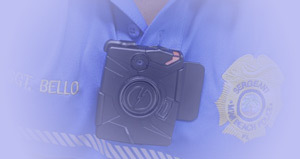 Many police departments are adopting bodycams before creating policies or procedures for compliance with open records laws, leading to erratic disclosure between jurisdictions and cases. As such, there should be little argument that bodycam videos are public records subject to disclosure under most open records laws. They are created as part of the official operations of police departments, are under their control, and relate to the public’s business. Emerging technologies – from email to dashcams – have required state agencies to adjust their practices in the past. While bodycam videos may present a few new twists, they can be accommodated under existing law. Redacting exempt images from a video before it’s released is possible, despite what some law enforcement agencies might argue. There are many affordable video editing programs that can blur or pixilate faces and other information from whatever part of the video needs to be redacted. Some programs even have intelligent features that can automatically track faces, substantially reducing a department’s administrative burden. When it comes to exemptions themselves, privacy can be a potentially complicated issue. Body cameras may record sensitive material, such as the identity of a sexual abuse victim, a young child, or simply the interior of a home. Almost all states have privacy exemptions that allow this type of information to be withheld, but there still may be a public interest in disclosure in those situations – for example, if there is a questionable use of force inside someone’s home. Some states balance privacy exemptions with the public interest, which may allow these videos to be released. Research your state’s law to understand privacy concerns that may arise in bodycam videos and what you might do to encourage their release. A second exemption that may apply to bodycam videos concerns investigatory records. Many state open records laws exempt records that are part of an ongoing police investigation, which could include the video from bodycams. However, as with privacy exemptions, many states require a balancing test between the possible impairment of an investigation and the public interest. When making your request, be sure to include the best possible argument as to why the information needs to be available to the public. Another exemption that may be cited relates to personnel files and/or disciplinary records. It is not uncommon for states to withhold certain types of information about employees, whether it relates to sensitive data (such as Social Security numbers and home addresses) or performance evaluations. Generally, however, these exemptions do not allow agencies to withhold records that indicate employee wrongdoing, which is important to note when requesting access to videos that may show police misconduct. In Oklahoma, bodycam videos that show law enforcement personnel under investigation may be temporarily redacted to obscure their identity, unless the investigation lasts for an unreasonable amount of time. As with traditional public records, agencies may charge high fees for processing requests, creating a barrier to disclosure. Many state laws allow for the requester to be charged for the time it takes to locate, review and produce records, which can add up quickly when it comes to bodycams. In Florida, for example, one town submitted a bill for $18,000 in response to a request for 84 hours of video. Journalists requesting videos can try to avoid these costs by requesting as little video as needed and, if a state’s law allows for a fee waiver in certain circumstances, be sure to request one. Even though it would seem that most existing open records laws adequately balance the competing issues of privacy and law enforcement with transparency, many state legislatures are considering new exemptions for bodycam videos. In Michigan, a proposed bill would exempt all videos taken in a “private place,” except in certain narrow circumstances. A California bill goes much further, and would exempt all body camera video from disclosure, except to the person who is the subject of the recording. In addition, some police departments are simply refusing to release any body camera videos. The Los Angeles Police Department, for example, has stated that it considers all such videos to be “evidence,” and therefore completely exempt under the California public records act. In Washington, D.C., the Metropolitan Police Department has refused to release any body camera videos, claiming it cannot make the necessary redactions. As the use of bodycams expands, journalists and news organizations should be aware of these issues and any legislation that might affect their ability to access these video records. But police departments, reporters, and the public can also work together to find creative solutions to the issues raised by these videos. In Washington, the Seattle police department recently hosted a “hackathon” for members of the community to help it develop tools to automatically redact bodycam video. Bringing communities together to work towards transparency is good for law enforcement, good for reporters, and good for the public – the ultimate intended beneficiary of this new technology.